The United States is the second largest seafood-consuming country worldwide (China is number one), and more than 90 percent of the seafood consumed is imported. Less than 1 percent is tested specifically for fraud. 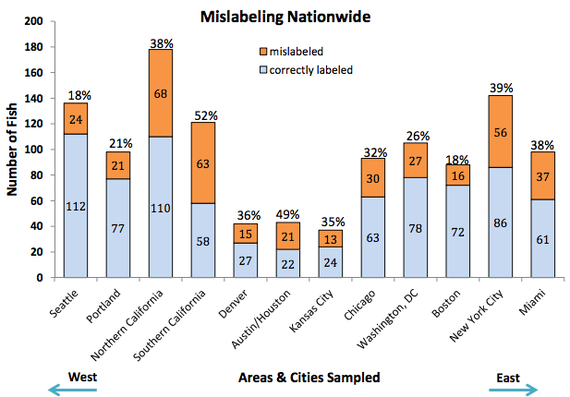 The report found that sushi restaurants have the worst level of mislabeling, at a staggering 74 percent. 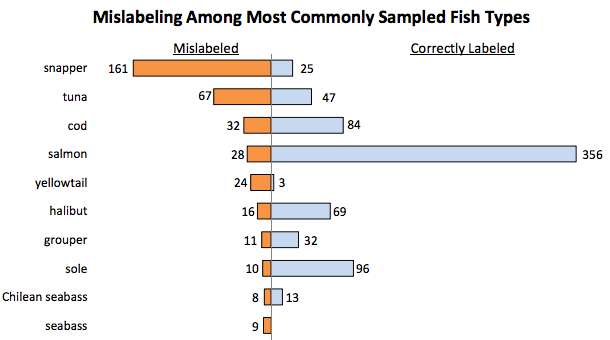 Thirty-eight percent of seafood at non-sushi restaurants was mislabeled and 18 percent at grocery stores. For example, 84 percent of the white tuna samples were actually escolar, a species that is known to cause digestive issues for certain individuals. Oceana also found that overfished and vulnerable species were substituted for what are commonly known as more sustainable choices. Atlantic halibut was sold as Pacific halibut, and speckled hind sold as red grouper. 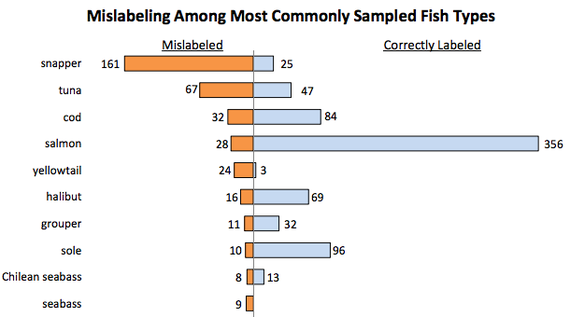 Oceana has released previous reports on seafood fraud. 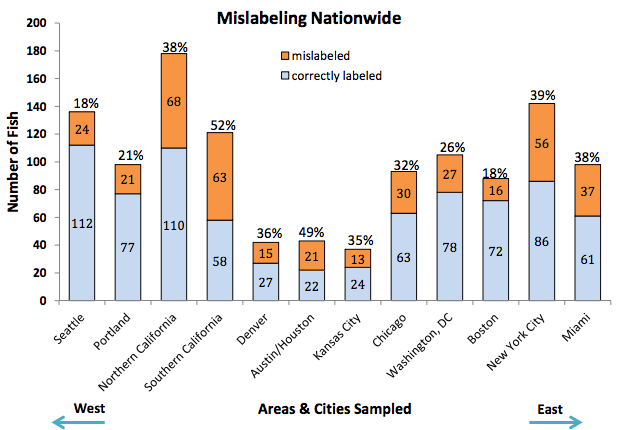 Two years ago a similar study found that about one-quarter to one-third of seafood was mislabeled, and other studies focused on specific regions have found similar statistics. Similarly, the Boston Globe released a study that found up to 48 percent of fish in the Boston area was mislabeled. Since these reports, a group of 500 chefs, including prominent seafood chefs Eric Ripert and Barton Seaver, have united to take action. They petitioned the government, and last year, the Safety And Fraud Enforcement for Seafood Act was introduced, though it has not been enacted. Concerned consumers are left with a few choices. They can advocate for increased DNA testing and full traceability across the fish supply chain. In a blog post for HuffPost Green, actress Angela Kinsey and Oceana CEO Andrew Sharpless also stress the importance of asking more questions to seafood purveyors. "We would not stand for beef or chicken being swapped for other forms of meat one-third of the time and we should not stand for the same being done with our seafood," they wrote.